Schematic of the widely tunable III-V-on-silicon laser. Silicon photonics has initially been developed for ultrahigh-speed data transmission in computing systems and data centers, because of the manufacturing in a complementary metal oxide silicon (CMOS) fab and the high refractive index contrast of silicon-on-insulator (SOI) waveguides. However, the technology also enables low-cost, low-loss and ultra-compact silicon waveguide circuits in the mid-infrared wavelength range. These waveguides allow realizing high-performance building blocks for integrated mid-infrared laser sources, such as filters, beam combiners and gratings. The integrated lasers can be used as light sources for miniaturized spectroscopic sensors where the sensing is done either on the chip or in free space. The development of integrated laser sources operating in the 2-3 μm wavelength range is very interesting for trace gas detection and bio-sensing since this spectral region contains strong absorption lines of many important gases (e.g., CO2, CO and CH4) as well as an absorption band of blood glucose. Recently, researchers from the Photonics Research Group of Ghent University-IMEC and the Walter Schottky Institute of Technical University of Munich demonstrated heterogeneously integrated widely tunable III-V-on-silicon lasers operating near 2.35 μm wavelength. In the device, an InP-based type-II epitaxial layer stack is heterogeneously integrated on a silicon photonic integrated circuit as the gain section to amplify the light. A Vernier filter consisting of two silicon micro-ring resonators is integrated in the laser cavity to select the lasing wavelength. The III-V-on-silicon Vernier lasers can provide a single mode tuning range over 30 nm in CW regime and ~50 nm in pulsed regime with a side mode suppression ratio higher than 35 dB over the whole tuning range. They also show that a wavelength tuning coverage over 70 nm can be achieved by combining two lasers with different distributed Bragg reflectors. Based on the tunable diode laser absorption spectroscopy technique, the laser integrated on silicon can be used to detect CO gas at different absorption lines. The experimental results are in good agreement with HITRAN database, which indicates that the III-V-on-silicon Vernier laser is suitable for optical sensing of gases over a broad wavelength range. Related results are published in Photonics Research, Vol. 6, Issue 9, 2018 (R. Wang et al., Widely tunable 2.3 µm III-V-on-silicon Vernier lasers for broadband spectroscopic sensing). Prof. Gunther Roelkens from Ghent University-IMEC, the principal investigator of this project, believes that this work has significance for miniaturized spectroscopic sensing systems. The further work will focus on the tunable diode laser absorption spectroscopy of multi-species trace gases and on-chip sensing. 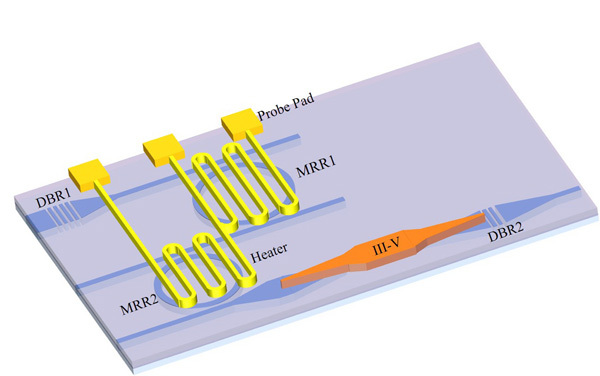 In parallel, III-V-on-silicon photodetectors and spectrometers have been developed using the same technology for a fully integrated spectroscopic sensor system on silicon photonics.